Introduction. On 18th September 2015, Gwen Richards and I were returning from a day’s botanising above Rhiconich in north-west Sutherland. 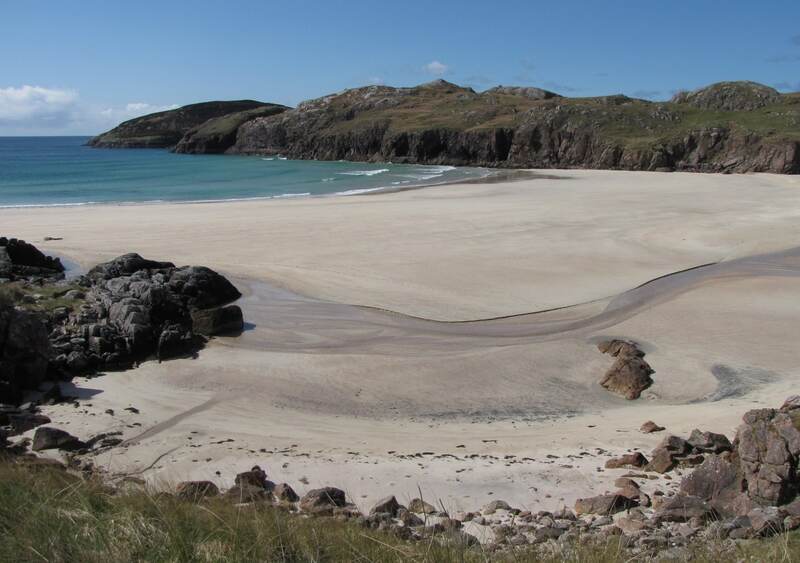 We stopped at Scourie to buy ice creams, as is our custom, and took them off to the beach (NC1444) to eat. There we noticed eight young people engaged in an apparently absorbing search for something on the sands. On being questioned, they rather reluctantly informed us that they were looking for cowries, something they always did on visits to Scourie. We had a look, avoiding areas they had already searched, and Gwen indeed found three specimens; I, on that occasion, found none, although my hit rate has improved since. Just over a week later, on 27th September, six members of the Assynt Field Club gathered at Culkein Drumbeg jetty (NC1033) to attempt a first local contribution to the Highland Seashore Project. We had had the benefit of a couple of shore-line courses led by Mike Kendall and most of those present had, like me, attended marine biology courses in their youth. We spent an hour in the kelp forest in the channel north of the jetty and then moved along the cliffs to a place where we could climb down to some good rock-pools. It was a very enjoyable exercise, but we found ourselves overwhelmed by the sheer diversity and relative unfamiliarity of the life forms encountered. It was decided, therefore, that a cut-down version of the Project might better suit our limited expertise, manpower and time (not to say agility, in some cases), and the first phase of Assynt Seashore Project was launched. We agreed to concentrate on just two important groups in the inter-tidal environment, brown algae and molluscs, and arranged a number of informal visits to local shores. 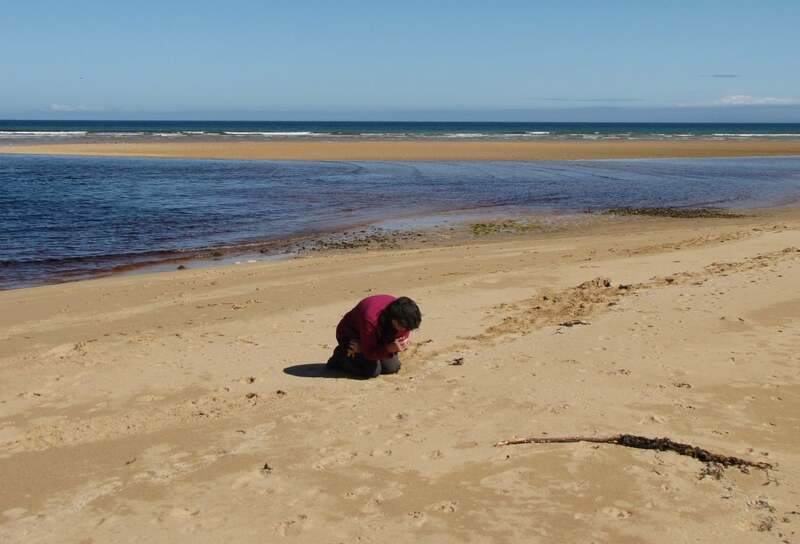 Since the spring of 2016, Gwen Richards and I have extended the geographical range of the fieldwork well beyond Assynt, mainly whilst visiting areas of the north coast to carry out botanical recording. What, where and how? The brown algae are of considerable interest in their own right, but I want to deal here just with the molluscs. Live material in situ is obviously the most reliable source of records, and provides a much better picture of the inter-tidal ecosystem. As with the brown algae, however, the widest variety of molluscs, especially gastropods, is to be found on the lower reaches of rocky shores, limiting useful access to low tides. There are also the practical and ethical problems of later returning to their natural habitat the live animals that cannot be identified on site. A pleasant alternative is to revert to one’s youth, and just go ‘shell collecting’ along strand-lines on sandy beaches, which are usually the most productive, especially of bivalves. Given the small size of many strand-line molluscs, you will soon find yourself on your knees, moving side-ways and, incidentally, leaving a very peculiar unilateral track. There has been some discussion about the usefulness of records based just on washed-up shells, so we consulted the powers-that-be, in this case the Conchological Society of Great Britain and Ireland. Their advice is that records of dead shells are perfectly acceptable provided that they are unambiguously recorded as such. In the course of these visits we have accumulated material of some 20 species of gastropods and about 40 species of bivalves, with quite a few, mainly smaller, shells still to be identified. Since one British list (Seaward, 1990) includes some 746 species (albeit with chitons, sea slugs and cephalopods thrown in), we still have some way to go. However, even our modest collection of specimens was beginning to pile up. Their storage was becoming something of a problem, until I discovered some compartmented plastic boxes at Hobbycraft in Inverness (very reasonable at £8.00), and later invested in a twelve-drawer stationery storage unit on wheels from the commercial stationers, James Dow (rather more expensive). Identification. Now to the business of naming one’s finds and useful sources of information, based on our admittedly limited personal experience. An initial word of warning: there have been a number of name changes. Examples are two very widespread bivalves: the pullet carpet shell, Venerupis corrugata according to the NBN, but also known as V. pullastra and V. senegalensis, and the striped venus, Chamelea gallina according to NBN, but also known as Venus striatula. Since older texts can be useful, recourse to the common name is sometimes necessary to find one’s way through a nomenclatural maze (see also reference to WoRMS below). The first port of call is the relevant section (pp.26-41) of James Merryweather’s User-friendly Seashore Guide (Merryweather, 2014). It has useful close-ups of diagnostic features of similar species, and although not exhaustive, provides an excellent start towards naming molluscs, as also many other aspects of seashore life. Everyone should have a copy of this text, if nothing else. Another recent book is The Essential Guide to Beachcombing and the Strandline (Steve Trewhella and Julie Hatcher, 2015). It is wide-ranging in its scope, has superb illustrations, a fascinating section (amongst many) on Exotic non-natives on marine litter, which includes molluscs, and is a ‘must have’ for anyone interested in objects found on beaches, whether natural or man-made. The definitive work for identification of all marine organisms is the Handbook of the Marine Fauna of North-West Europe (edited by P.J. Hayward and J.S.Ryland, latest edn. 2012). Molluscs occupy pp.484-628 of the 800 pages of this heavyweight tome. All species mentioned are comprehensively keyed, described and illustrated with line drawings. It is not a book for use in the field, on the grounds of both size and cost, but a necessary reference back home. Bear in mind, however, that although commendably wide-ranging in its scope, it has limitations. It mentions, for example, that there are some 15 species of scallops in British water, but keys just seven. Although ‘most are only found in deep water or offshore’, we have already come across one, the smooth-shelled Palliolum incomparabile (formerly Chlamys furtiva), that they do not mention. This may be because the species has only been very sparingly recorded, mainly around the coasts of north and west Scotland. Two older works are useful if you can lay your hands on second-hand copies. Both relate exclusively to bivalves, and complement the other works listed. 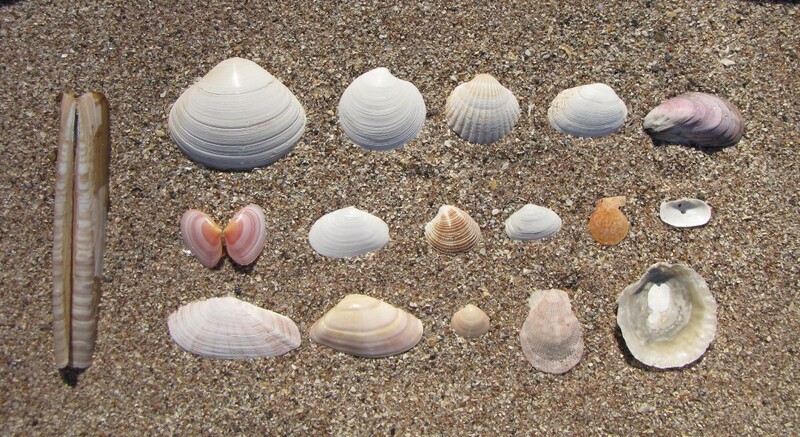 The first is British Bivalve Seashells. A Handbook for Identification (N. Tebble, 2nd edn. 1976). This is comprehensive, and has keys down to species level, very detailed descriptions and excellent line drawings highlighting diagnostic features. The other is Seashells. Bivalves of the British and Northern European Seas in the Penguin Nature Guides series (J.M. Christensen and S.P. Dance, 1980). This has a very interesting introductory text on the biology of the group and, again, excellent coloured illustrations, which are a mixture of photographs and paintings. Websites. The best found so far, albeit restricted to bivalves, is Marine Bivalve Shells of the British Isles on the website of the National Museum of Wales (http://naturalhistory.museumwales.ac.uk/britishbivalves). It keys some 380 species, with superb photographs (rather more taxa than in Seaward, 1990, probably because of a different geographical scope). Also good for checking currently accepted names (see above) is the World Register of Marine Species (WoRMS), whose bivalve section, for instance, is at http://www.marinespecies.org/aphia.php?p=taxdetails&id=105. A reminder of the exceptional biodiversity of marine ecosystems is provided by its statistic of 243,048 accepted species. We should be interested to hear about other sites that you find useful. Some highlights. We have still to work up much of the contents of the cabinet we have almost filled over the last year or so, but I should like to conclude with an account of some finds that we have found especially delightful or challenging. Cowries (Trivia). These were the starting point of our interest in shells, and their discovery continues to be a pleasant challenge. 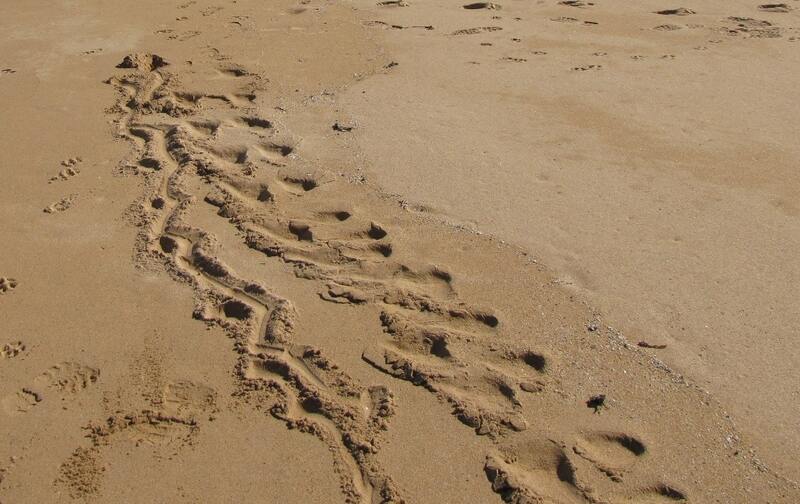 However, we have managed to find them on most beaches visited, particularly those that have rocky areas. We have so far named them all as spotted cowries Trivia monacha, since a proportion of fresh specimens do have the three dark spots diagnostic of this species. As the only other character of the northern cowrie T. arctica, apart from slightly smaller size, is that the back end of the foot is yellow rather than striped, we may be overlooking that species. Their distributions around the coast of the British Isles, according to NBN, are essentially similar. Limpets (Patella and Helcion). We must admit to having, so far, bottled out of separating the common limpet Patella vulgata from the China limpet P. ulyssiponensis, which is unfortunate since limpets are one of the commonest shells on all kinds of shores. The key in Hayward and Ryland uses the colour of the pallial tentacles, foot and inside of the shell, which requires live material or fresh shells. We shall have to try harder, although we note that two of the other texts mentioned also avoid the issue. We were pleased, however, to discover that the delightful blue-rayed limpet Helcion pellucidum, which lives on Laminaria fronds, exists as two sub-species, the translucent typically blue-rayed H .p. pellucidum and the chunkier, dull H. p. laevis, both of which occur commonly. Two other so-called limpets belong to quite another family, the Fissurellidae, and we have found examples of both just once so far, on Balnakeil beach. They are the slit limpet Emarginula fissula and the keyhole limpet Diodora graeca. Both hail from rocky shores and descend to depths of 250m., but their shells are fragile and they may be genuinely uncommon on shore-lines; we shall see. Winkles (Littorina). This is a mixed bag, with Hayward and Ryland listing ten species. The common periwinkle L. littorea is the most abundant, particularly on rocky shores and usually readily recognisable by its sheer size. We were slightly dismayed to find that the flat periwinkle beloved of small children (and overgrown ones), because of its bright yellow and other colour varieties, is in fact two species: L. obtusata (with a shouldered spire) and L. mariae (without a spire). However, mature shells can be readily distinguished with practice, since they generally occur together. The rest of the genus presents considerable difficulties, partly owing to ‘the degree of overlapping characters between some species’, and also because ‘the taxonomy of the L. saxatilis complex has long been disputed’. Enough said. Two other groups of gastropods bear mention. The first is the netted dog whelk Hinia reticulata and its close relative the thick-lipped dog whelk H. incrassata; we have found both, but worn shells are tricky to differentiate. 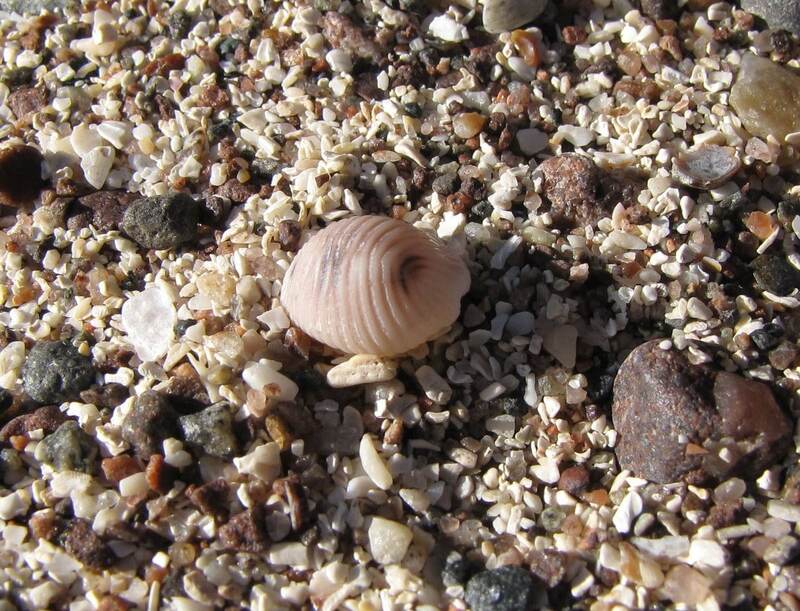 The second is the necklace shells Euspira (formerly Natica or Polinices). Bivalve shells neatly drilled by these predators are very common, but we have only so far found one complete shell of the culprit, at Clachtoll, probably the alder necklace shell Euspira nitida. Bivalves. As already mentioned, our finds in this group are much more numerous, and we are still on a fairly steep learning curve with regard to their identification. The remarks that follow should therefore be regarded as very preliminary. The heavyweight in this group, the mahogany quahog or Icelandic cyprine Arctica islandica, was the subject of a previous article in this journal [Highland Naturalist] by David McAllister (THN 11, 14-15, 2015). We have found whole shells at Nairn and, rather to our surprise, fragments, which look like broken china, on just two occasions on the west coast so far, at Inverkirkaig and Oldshoremore. Also large, but nothing like so massive, are the widespread otter shells and gapers. Only the common otter shell Lutraria lutraria occurs around our northern coasts, usually associated with soft substrates. We do however have two species of gapers, recognised by the large spoon-shaped processes in their hinges, the sand gaper Mya arenaria and blunt gaper M. truncata. Scallops (Pectinidae). 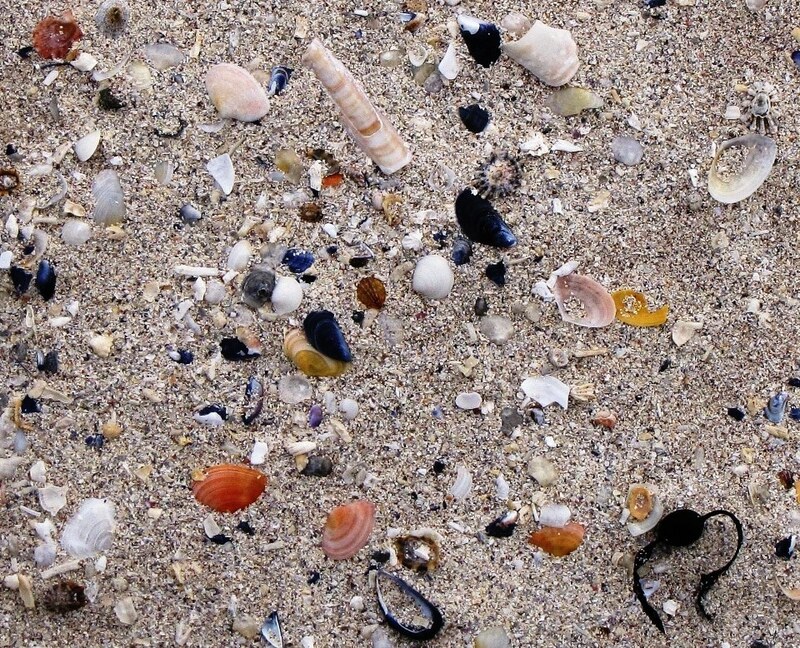 The colourful shells of this family have given us a great deal of pleasure. The great scallop Pecten maximus occurs most often as fragments. 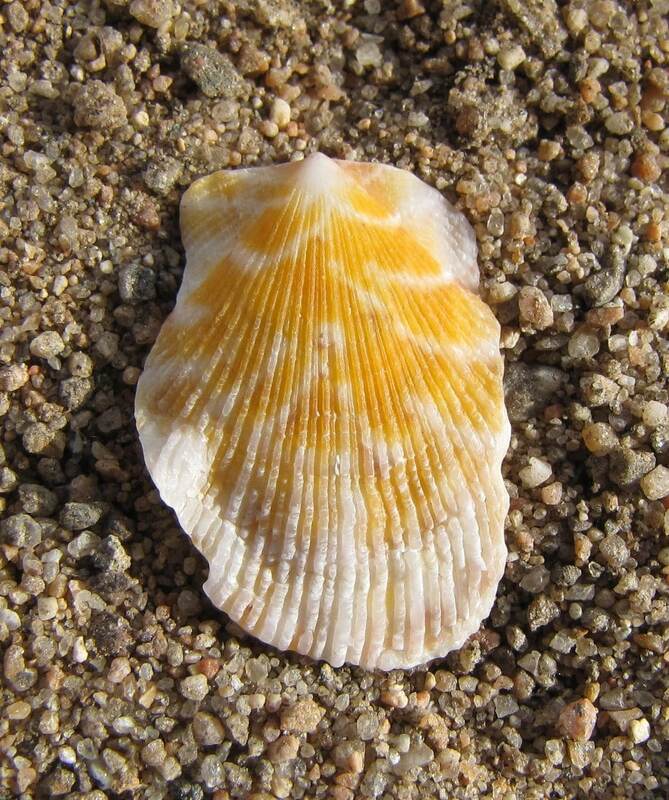 Commonest amongst the smaller species is the variegated scallop Chlamys varia, with its lop-sided ears and numerous ribs, which exists in a wide range of colour patterns from off-white, through yellow and orange, to brick-red, purple or brown. We have only come across the queen scallop Aequipecten opercularis twice so far, at Nairn and Strathy; specimens from the latter beach were perhaps uncharacteristically small (at about 1cm). 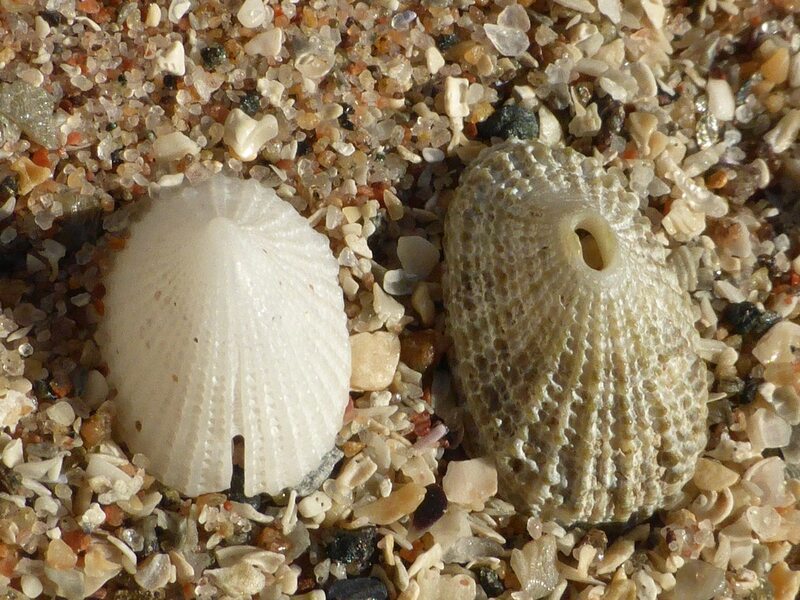 The tiny shells of two other species are amongst the gems of the shoreline, the smooth ones of Palliolum incomparabile (see above), and the fluted ones of the tiger scallop Palliolum tigerinum. Also common, now that we have recognised its curiously ‘bumpy’ shells, is the hunchback scallop Chlamys distorta. Native oysters Ostrea edulis have been scarce so far, and we have only found the introduced Portugese oyster Crassostrea gigas where it has been farmed. Saddle oysters belong to an entirely different family, and live attached to hard surfaces by a plug that passes through a hole in their lower valves. The commonest species appears to be Anomia ephippium, with three separate muscle scars on its upper valve, but there are related species with two separate or fused muscle scars that are well illustrated in the older text by Tebble. 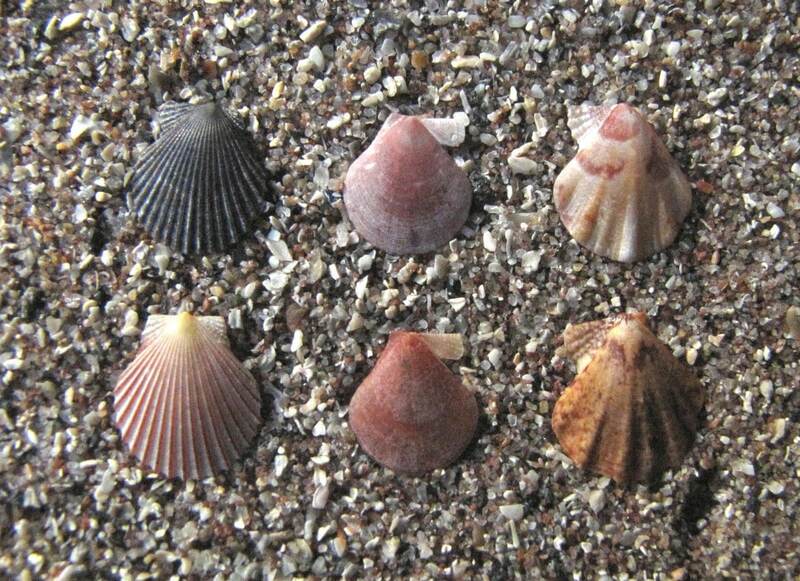 The variety of form and colour exhibited by other bivalves is perhaps best illustrated by a selection of those collected at Oldshoremore on 20th March 2016. They range from the very common pink or orange fragile shells of the thin tellin Angulus tenuis, through a variety of more robust cockles, mussels, razor shells, trough shells, carpet shells, sunset shells, wedge shells, venuses and artemises, to the delicate white shells of Cochlodesma praetenue, which has a Mya-like spoon process and a curious crack near the hinge. Their precise shape can be quite a useful guide to their identity, but careful attention to technical features, such as hinge architecture, muscle scars and pallial margins, is necessary for certain naming. Those more knowledgeable will hopefully forgive this discursive account of our stumbles into an aspect of natural history relatively new to us. Shell collecting is not rocket science, but it can be very good fun, and trying to name one’s finds is quite as challenging for this group as any other. Our advice is to get out there and have a look for yourselves. Thanks to Stephen Moran for his encouragement (based on many years shell collecting around the Firths and, in his youth, along the shores of Yorkshire), to David McAllister for his helpful comments on a draft of this article, to Don O’Driscoll for his introduction to the delights of Oldshoremore, and to members of the Assynt Field Club, in particular Clarinda Chant, for their company on some chilly excursions. Reference Seaward, D.R., 1990. Distribution of the marine molluscs of north west Europe. Nature Conservancy Council (available as a pdf download). Photographs by Ian Evans unless captioned otherwise.